Another week, another progress report. This week we focused on core game mechanics and under the hood stuff. Our combat system is the primary focus at the moment, but we are also working on game related systems like skills and abilities. This week I've been focused on our ship combat. We've been trying out a few different ideas and methods to hopefully get the feel of combat somewhere fun and exciting. 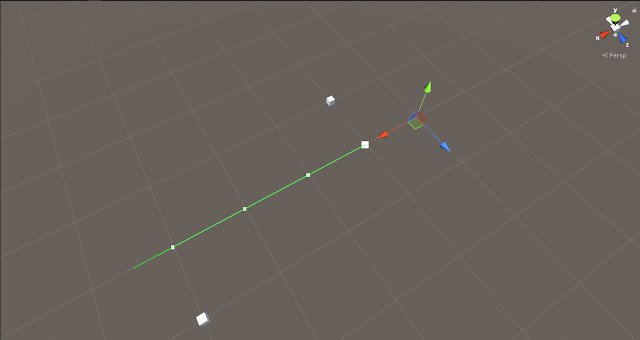 I've been doing research into Bezier Curves and creating a pathing system that can be plotted out by setting points to a position. This allows the player and enemy fleets to automatically plot their attack and overhaul vectors, while the player focuses on setting up attacks and managing their fleet combat. The second part of this system was to have an object follow along the path and follow a few rules like velocity direction. This is so far proving to be the most difficult aspect of games development but we're confident that with a little time we'll have working combat part of the game. We want combat to be dynamic and exciting, but not overwhelming. Managing seven ships is hard enough, but maneuvering them as well would be too much. This is why the players ability to control fleet movement directly is limited to choosing engagement distance and acceleration or deceleration. I tackled the ability and skill system this week, while also looking at the repair system, time mechanics and icons for various things. For the feature demo, we are planning to have around 70 abilities and skills for the player to choose from, and around 30 support abilities. These range from weapon abilities that change the firing behaviour of turrets or abilities that can be toggled for passive benefits. Abilities are engaged by officers the player has hired and these abilities are modified by support staff that are linked to the abilities on the ship. In this way abilities can be modified or adapted to suit the player's unique style. Abilities are mostly offensive orientated and focus on attacking enemy ships. Skills are modified by the crew the player has hired and have weaker effects than abilities, but last longer. Skills are mainly defensively orientated and focus on repairing the ship, healing crew or regenerating parts of the ship. Another feature we worked on this week was the repair system. In FTC, a player needs certain items to keep the fleet going like supplies, components or fuel, but these things are expensive to generate. Spread among the systems are outposts and stations that provide repair facilities for a cheaper price, giving players another option to repair and re-arm their fleet to save on protium (the main currency within the game). Time mechanics in FTC is closely related to the experience system, in FTC, every action provides experience. This system is modified by difficulty. Difficult encounters provide more experience than simple encounters. In this way, players can follow a variety of gameplay strategies without being punished for avoiding combat or having to destroy enemies. That is all to report this week. Next week we are planning on releasing an announcement trailer and hopefully a short trailer showing some of our planned combat system.